She may be petite, but this woman can wield a weed wrench. 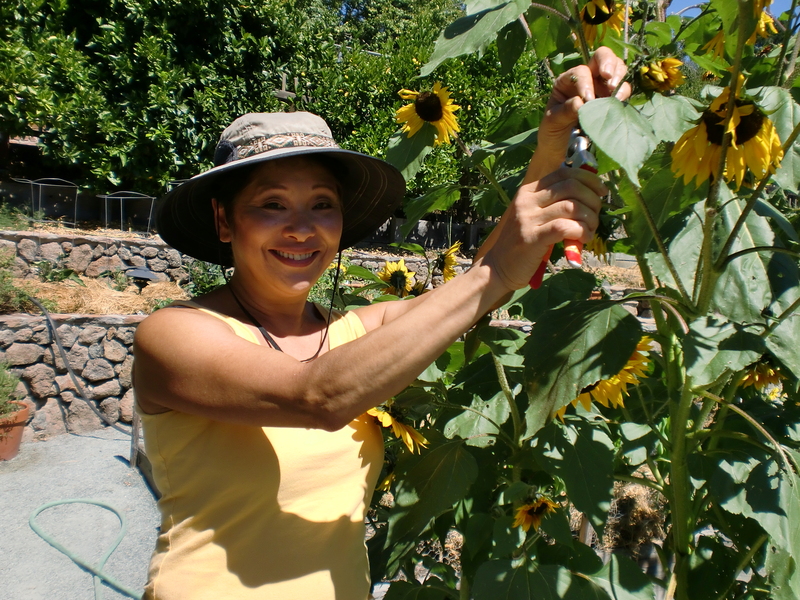 Acclaimed television anchor/reporter Wendy Tokuda is waging war against one of nature’s bitter enemies – invasive plants. Seven years ago, when Tokuda first moved to the hills from Piedmont , she noticed that French and Scotch broom were choking the native plants in her neighboring parks. Being an avid gardener, Tokuda couldn’t let the weeds win. Tokuda’s own home reflects her views on working with nature. Solar panels on the roof tap the sun for electricity and heat. Two giant cisterns collect rain water for crops – and her garden is a mosaic of fruit trees and vegetable vines with stalks of smiling sunflowers at the corners. It’s a happy place “patrolled” by her yellow lab Lucy, who occasionally helps herself to a Japanese pear. But it’s Tokuda’s work in the parks that really fuels her passion. For a public figure who’s earned dozens of prestigious awards for her broadcast work, pulling broom may seem like an odd pastime. She readily agrees. “I’m really a little embarrassed,” she laughs, admitting that restoration has become a bit of an obsession. But pulling broom quiets her mind. “There’s a Zen thing to it. You’re not going to get a lot of money or accolades. But I can see the results – other plants coming back like wild roses and native grasses.” Ultimately, she sees herself as a steward of the earth. And like a gardener who nurtures her sprouts, Tokuda is in it for the long haul. 1. Buy a high quality composter. “The big dirty secret about urban composting is it attracts rodents,” she says. For her own garden, Tokuda has two $350 composters that keep critters out. 2. Water with rain water. Tokuda has two 500 gallon cisterns outside her hills home that collect and hold rain water. They’re connected to a hose so her husband can water the impressive fruit and vegetable garden in their back yard. A grey water system (Tokuda believes it was the first in Oakland ) funnels water from the showers and bath into the rose garden and pumpkin patch. 3. Speaking of roses, Tokuda recommends Bourbons. These ‘old roses’ are intensely fragrant and classically beautiful. 4. Cover the ground around your plants with Alfalfa straw. Tokuda says you don’t need to weed and it cuts down on watering.